It’s only natural for kids to grow up idolizing professional athletes. For me, it was Brett Favre and Troy Aikman. I would watch them on TV and then try to recreate their highlights in my backyard. When I was 10 years old, I started playing “real” football, and I still remember that feeling of scoring my first touchdown. Football has taken me on a life journey full of ups and downs. From tearing my ACL my sophomore year of high school, thinking I would never play again, to being selected two time all-conference and once all-state earning a college scholarship to play quarterback. There is no doubt in my mind I would not be the person I am today without the skills I have learned from football OFF the field. The discipline, the teamwork, the attention to detail, the hard work and the sacrifice has molded me into the person I am today. Working at SCHEELS, I get the opportunity to sell “fun” to our customers every day. Whether it’s an A2000 baseball glove or a set of shoulder pads, not much compares to seeing their faces light up with excitement as a new season begins. 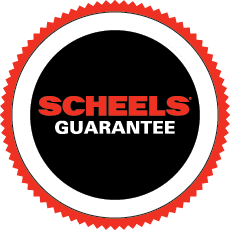 I have to say my favorite part about working at SCHEELS is when those same customers come back at the end of the season and tell me about their successes. Most recently, I was helping a young lady pick out a new softball bat. We narrowed it down to a few different bats and after swinging them, we decided that an end loaded Demarini was the right bat for her. A couple of months later, she was in the store with her family and they waved me over. We huddled in the middle of the softball shop and watched videos of her home runs from the season. Those moments make my job extremely rewarding.